It was an extremely wet Open Day for the Cold War Jets. Thank you to the photographers and friends who stayed to the end to capture the Victor aborted take off demo – you were heroes and produced some excellent photography. Many thanks for sharing them with us. The two jets had a few faults when starting up on Saturday to position down to the start line for Sunday. No 3 on the Victor got too hot on start and was closed down. We tugged it directly into wind, it did the trick, just, and 3 and 4 started just within EGT limits. The Nimrod has not been moved for two years, so problems were anticipated. The brakes seemed to be sticking on after applications. A novel solution found after shut down involving a bungee cord to assist the the release of the pedals, assumed as the culprit, worked. Sunday weather deteriorated around 1030 and set wet for the rest of the day. 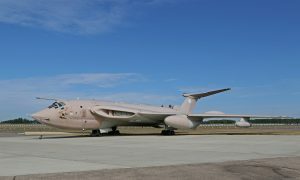 However, both the Victor and Nimrod engines and systems behaved perfectly – testament to the work of our ground crew. The Nimrod fix was excellent and learning from the previous days ticklish engine starts, the Victor was aligned to make best use of any headwind. After the display they are both now put to bed for the winter. We do hope to see you in late May. Amanda delivering a shower and spruce up. Damp but satisfied – flight deck happy faces. Preparations are well in hand for the Open Day and taxy demos on Sunday 26th May. Tina has had the nose art refreshed and is looking good in the blue sky backdrop. As usual we will have a host of goodies on sale from our tent- surplus parts, logo’d merchandise and book signings by Bob plus our friends with their excellent book series Out of the Blue, the proceeds from these go to the service charities. At the last Open Day we were available to the public right up to the time we crewed in on the marshaling apron. So why not come on over to meet us and ask away, we are always delighted to talk about Victors. See you there.